It was hanging in our front parlor, a huge picture showing a man in uniform. His face had a stern faraway look, his dark hair was parted on the right side of his head and he wore a little mustache. I looked at him every day and when I asked my mother who he might be she said that he was my Hitler Papa. This was a good thing. 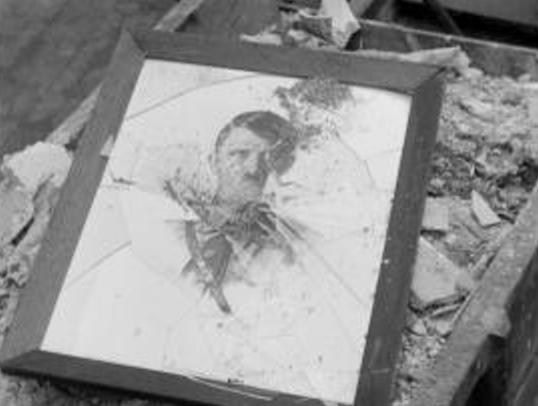 Guenter, my friend, had a small photo of his Papa on the sideboard of his living room, I only had this picture of Hitler Papa, but it was very big and important. Guenter’s Papa was a soldier in the war. He wore a uniform, as did my Hitler Papa. Everyone was afraid. So many houses had been bombed and we spent a lot of time in our coal cellar. I hated the high-pitched swishing sound the bombs made, a sound worse than the wailing of the sirens signaling the onset or the end of an air raid. This had been going on for some time, only now it was worse. Everything was changing. My mother went out with “the girls” and they all came home carrying many good things to eat. There were cigars and liqueurs, there was even a box of colored plasticine for me to play with. My mother said that, since it was the end of the war, the provisions stored in the big warehouses would soon be taken by foreign soldiers. So people living in the neighborhood had broken down the doors and everyone had taken as much as they could carry. Battles were now fought very close to our city. The grownups talked about the Russians taking over. Those soldiers, they said, were brutal. My mother and the other women in our house were very scared. Indeed, at war’s end the Russian sector was only 10 km east of our city. But in the end it was the Americans who came. Preparations were frantic. After sampling our spoils we quickly hid everything in the cellar. We buried boxes and bottles under mountains of coal, cherished valuables were secreted under heaps of turnips and cabbages. I helped. Upstairs we searched the house for anything we thought unacceptable to invading troops. There was, of course, the portrait. 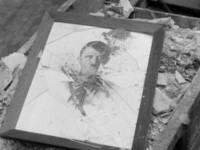 It was taken down in haste and everyone pitched in smashing the frame and cutting the picture into little pieces. Overcoming my initial astonishment I helped. It was fun. When finished we carried all the little pieces to the back of the house and buried them deep in the vegetable garden. My Hitler Papa had been done away with, he was gone. Two days later we all stood in the front parlor holding white dinner napkins. My mother had explained that this was done to show we surrendered. I was hopping mad because I wanted to surrender on my very own, holding my own white piece of cloth. There weren’t enough napkins and I was forced to hold on to my mother’s. Soon soldiers came into the house; one of them smiled at me and I wasn’t angry anymore.